Miss my review of the first issue of this series? Go here! 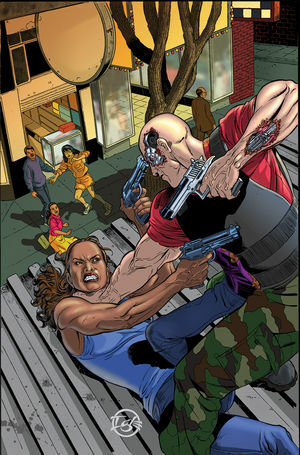 Terminator: Enemy of My Enemy #2 has a much less muddled plot than the first issue, thankfully. The women continue to be really cool, and a third woman, a scientist working with a new kind of terminator model, is introduced at the end of this issue. Farrow starts to question WHY she has to capture Elise, and the conversation they have reveals exactly why everyone might be after the scientist. It’s pretty awesome that all the women in the comic are employed in jobs normally associated with men – scientist, CIA operative, helicopter pilot. The art still seems a little off, with people (especially Farrow) becoming off-model in some panels, but it’s an improvement over the previous issue. The action panels continue to be the strength of the series, with lots of colorful explosions of both the mechanical and bodily varieties. You can tell the artists have the most fun with those parts! This is definitely a comic for action lovers. Get it from Dark Horse Comics or your local comic book shop for $3.99.